Help, my broadband is not working? If your broadband is normally reliable but is misbehaving, then we may have some tips to help you out. Biggest tip is first make sure the issue is not your own Wi-Fi, so check to see if a device connected using an Ethernet cable is any better. Some web pages load and some don't? When I receive a phone call my broadband breaks? My broadband is slow every night? Why are my game downloads slow compared to speed tests? Will a faceplate filter make my broadband better? I switched provider but some sites are now very slow? The system that converts web site names into IP addresses that the computer and broadband actually understands known as the Domain Name Server (DNS) may playing up. To test this you can usually manually specify different DNS servers on an individual device or on non provider supplied broadband routers you can override the defaults. OpenDNS or Google DNS servers are often a good backup choice. Its always worth taking a look on social media, as if its not just you everyone else is invariably asking questions on twitter or facebook within minutes of major sites or a provider having issues. Tablets, smart phones and devices like Fire TV sticks are wonderful devices and their use of Wi-Fi makes using them so much easier, but Wi-Fi can be very variable in its performance, so before blaming your broadband provider check that its not just the Wi-Fi by using something connected via an Ethernet cable. If you regular stream films to your TV consider buying a streaming box or connecting the Smart TV via Ethernet to increase reliability, or install a Wi-Fi extender. Read our Wi-Fi troubleshooting page If you're experiencing problems with Wi-Fi. Broadband disconnecting when the phone rings or someone is using the phone points to an internal wiring problem with the phone line. Fixing your extension wiring is your responsibility, or you can pay a telephone engineer to do it, either via Openreach or from the Yellow Pages. A simple way to check if your phone wiring is suspect is to remove the lower half of your master socket carefully and expose the "test socket" (the socket into which the faceplate plugs into) for a phone, and plug a known working microfilter in, and your broadband router into that. If everything is good and the phone works reliably then you have phone wiring problems. The easiest solution is to rip out (or just disconnect) all the extension wiring and invest a set of DECT cordless phones for around the house. The free option is to remove the wire on pin 3 on the faceplate, this is the ring wire which is not needed for modern phones but creates an imbalance that affects the DSL signal. 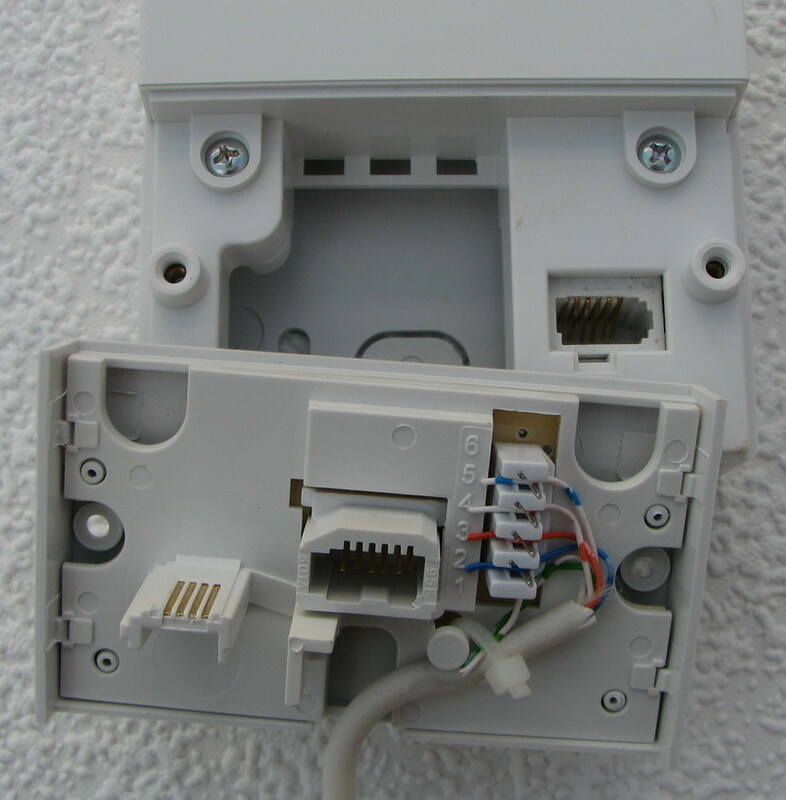 If there are still problems when using the test socket, unplug the microfilters and broadband modem and check that a corded phone is working reliably without any undue cracking or pops; if the line is noisy with just the phone connected report a voice fault to your telephone provider, and when an engineer arrives demonstrate the issue. The NTE5C is the a new style of master socket which once fitted needs no tools, the lower front part simply clips on/off by pressing two bumps on the side and when it is removed the extension wiring is actually attached to the back plate and labelled 5,3,2 i.e. the blue connector. 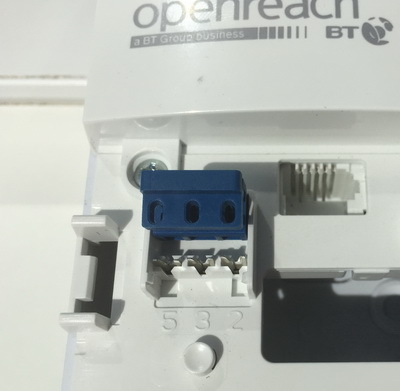 The NTE5C is tool less so if you do have an extension connected and the ring wire (pin 3) is connected you can usually improve reliability (and speed too) of your broadband by lifting up the blue connector and removing the wire in hole 3 and then pushing the connector back down - make sure the wires in 2 and 5 are pushing fully home before closing connector. The removal of the small faceplate disables the phone extensions by virtue of the fact that the signal to the extension socket goes into the smaller faceplate and back out again to the rear faceplate. If the line is otherwise quiet but incoming calls continue to cause problems when using the test socket, this may be what is known as a High Resistance fault (HR fault) and should be reported to your phone/broadband provider. Microfilters and broadband modems don't last forever, so it may be worth borrowing a micro-filter and another router just to be sure, since if the problem is down to your hardware you can be charged for the engineer to visit and just tell you that your hardware is at fault and this bill might be over £140. NOTE: If you have proved the fault is outside your control and appears to be on the Openreach side of the network fixing it should be free (i.e. part of the line rental fee each month) but as some faults are intermittent finding the problem and fixing can be troublesome. High Resistance faults generally get worse over time, so sometimes if you can wait until it gets bad rather than reporting a fault the first time you see a single error the higher the chance of a fix. You may have lots of errors on your ADSL2+ or VDSL2 due to extra noise that is prevalent as the sun sets, so in the winter you will notice problems from 4pm onwards, but in the summer everything may be fine until 10pm. In which case fitting a faceplate filter or removing the ring wire from the master socket faceplate and extensions may well reduce the number of errors. So you know your broadband is running well, but a big 3GB patch to a game is taking forever to download? Unfortunately, there may be millions of others trying to download the same file and the servers supplying the file are having to deliver to lots of people all at the same time. The busiest times on the Internet are often days when a big game release coincides with new version of operating system for a mobile phone, so unfortunately while having a 500 Mbps connection means you can download quickly, many sites may limit your individual speed to a lot lower figure. If you share your broadband connection with others in a house its always worth double checking that that others aren't using the connection; remember uploading a large video to YouTube can saturate your upload connectivity, which in turn will slow down downloads too. An easily overlooked problem even if you are using an Ethernet cable is that sometimes the cable may not be working well i.e. network card is running at 10 Mbps rather than the preferred 100 Mbps or 1000 Mbps, in which case try a different cable. If your network card is stuck at 10 Mbps no matter what cable you are using you may find adding an Ethernet switch between you and the router may help, that is assuming your Operating System has not accidentally set the maximum speed of the network card down to 10 Mbps. Microfilters are usually supplied by providers when you sign-up. On ADSL2+ micro-filters are great and save a lot of hassle. Whilst they can help with VDSL2 (superfast fibre services from Openreach), removing unused phone extensions or fitting a faceplate filter would be the best option. an interstitial style which simply stow between the small removable part of the master socket and the back box; these are slightly more expensive but you don't need to change any wiring and they filter all your phone extensions and provide a socket for connecting your broadband modem. replacement faceplates are available that fully replace the removable part of the Openreach master socket and perform the same job as the interstitial faceplates. Both varieties now usually have additional connectors to allow you to run a dedicated data extension so if your master socket is not in a convenient location you can put the modem elsewhere. On the VDSL2 services it is recommended you keep any data extension length to a minimum. If you are using the same broadband technology with the new provider and have signed up to the same broadband speed package, then its worth checking to see if the sites that are slow are slow at off-peak times. Broadband providers have many different links to the Internet so its possible some of these can be congested and others working smoothly.